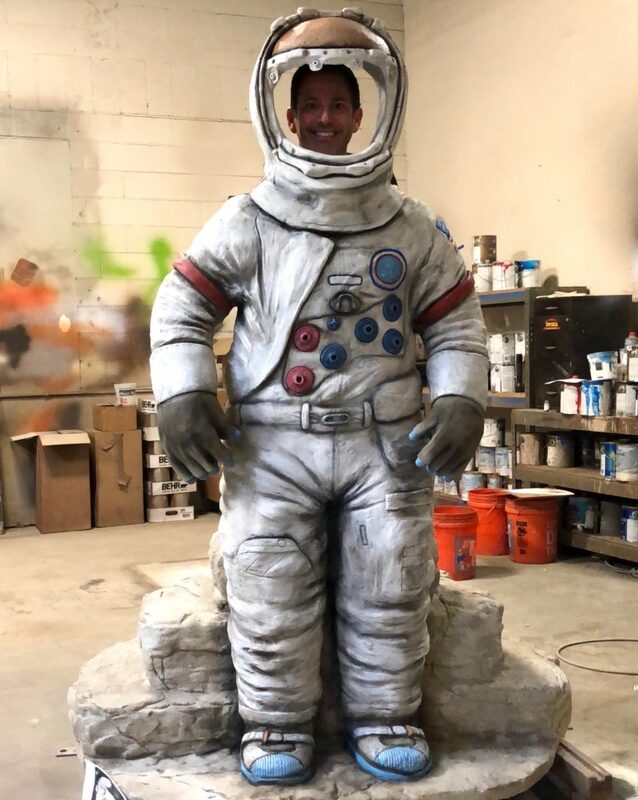 A 1,500-pound astronaut is under construction to accompany the interactive lunar rover replica display planned for downtown Kent. The Kent Downtown Partnership (KDP) leads a fundraising drive to bring the replica to Kherson Park, 307 W. Gowe St. The astronaut will soon be finished and be used to help raise funds for the lunar rover replica display. “We’ll include the astronaut as part of a display at accesso ShoWare Center to help continue our fundraising effort, and build community awareness about the amazing history made in Kent,” said Michelle Wilmot, city economic development program manager, in an email. City and ShoWare officials are figuring out when the astronaut display will go up at the arena. Minnesota-based Cre8Play is making the astronaut and will produce the lunar rover. The exterior of the astronaut is made out of fiber reinforced concrete. The core of it is 3D printed out of a foam product. The lunar rover will be mostly metal. Nearly $13,000 has been raised so far with a goal of $125,000 for the lunar rover replica display, Wilmot said. That figure doesn’t include a $10,000 commitment by the Kent Lions Club or the corporate match offered by Boeing to its employees and retirees who contribute. “We anticipate additional funding will be necessary too, to make necessary improvements to make way for the lunar rover, and then there’s interpretive signage, recognition plaques, etc.,” Wilmot said. KDP had a “Bring the Moon to Downtown Kent” dinner and auction on June 1 to help raise funds. The event included special presentations by Michael Lombardi, a Kent resident and corporate historian at Boeing, and Harris Atkins, a retired Boeing aerospace engineer and manager on the lunar rover project. First built in Kent at the Boeing Space Center in 1969, three lunar rovers travelled to the moon on Apollo Missions 15, 16, and 17. The 50th anniversary of the Apollo program is next year when KDP and city staff hope to get the display up. City staff is working with King County’s Landmarks Commission to designate the three lunar rovers remaining on the moon as community landmarks. Other projects include the development of commemorative markers along the Green River Trail as a way to honor the history of aerospace in the Kent Valley. “The thinking behind this effort is that by placing a lunar rover replica downtown, we can bring awareness to this incredible history, foster community pride, fuel our kids’ imaginations and inspire us to imagine what’s possible in the future,” Wilmot said. Donations to the lunar rover replica display are tax-deductible and can be made online at downtownkentwa.com/rover.